In a bowl or on a clean kitchen surface, mix all the ingredients into the flour, with a pinch of salt. Knead until you obtain a dry crumbly mixture. Butter a round baking tin and drop the dough in small lumps into the tin about 1 inch thick. Bake in a pre-heated oven at 350° F / 180° C / G4 for an hour, remove from the oven and allow to cool. Remove from the baking tin and serve. 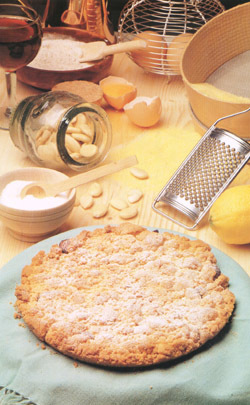 Sbrisolona crumbles when you break it and is therefore difficult to cut regularly. This does not stop it from being really delicious.